Jan Hus was born in 1369 in Husinec, Bohemia. He became a priest in 1402 and started preaching in Prague. Hus's opinion was different from the doctrines of the Roman Catholic Church. He was influenced by the writings of John Wycliffe, that is why he wasn’t afraid to demand reformation of the Church. Hus was arrested in 1414, and tried in June. He was sentenced to death. 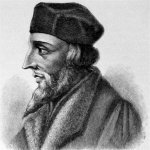 Jan Hus was executed on July 6, 1415. He was burned on a stake together with his writings, that was against the doctrines of the Catholic Church. Execution of Jan Hus had a great aftermath. His teachings had a strong influence in Europe and led to rebellion against the Roman Catholic Church and its rulers. About a century later 90% of inhabitants of the Czech lands were non-Catholic. Although reformation of the Church wasn't implemented, Jan Hus is respected in the Czech Republic as a fighter for Czech identity and a linguists. Traditional bonfires are burned on July 6 to commemorate Jan Hus.